Do you ever wish you could take a peek into your child’s young mind and see what it is that makes them think, feel and act how they do? Do you sometimes worry that you’re not communicating with them very well or that you might be missing a teachable moment to help them grow, feel safe, and feel loved? Are you ready to spend time with them individually and no longer miss out on the details of their day?!? I know parenting isn’t easy… but it is one of the most rewarding things any of us will ever be a part of! (So many ups & downs, am I right?!) I’ve shared plenty of fun activities on my blog that encourage us to spend time with our children, but the idea I am going to share with you today takes it even one step further. “Life According to Me” is a darling child’s journal written by Stephanie from Somewhat Simple that will help you capture their youth and give you an inside glimpse of your child’s thoughts and feelings- all while having FUN! It’s more than a boring journal with lined pages- it is fun & interactive with 30 pages of daily prompts, fill-in-the-blanks, and spaces for kids to draw and doodle. If you can get your kid’s creative juices flowing and open the door for communication, you’ll catch a better glimpse of what is going on in their little brains. Older kids can write their thoughts, little kids can use the space to draw pictures or you can encourage them to do a combination of both! One of the best features of this journal is the spot on each page for your child to write a letter to you and the space for your response. They write about ANYTHING they want – from funny things that happened at school, to questions about their science projects and information about their secret crush. Get ready to experience moments of their day that you would have missed and the small details of their lives you could have easily brushed aside. Your response will show your appreciation for them, to make sure they know that you love them. Validate their thoughts so they know they were heard and share bits of wisdom when a moment presents itself. These letters will create a place for you to communicate with each other frequently. Start creating precious moments within your home TODAY for only $5.95! *This is a DIGITAL E-Book. It will not be shipped to you. You will receive a download code immediately upon payment. Two lucky readers will win their very own copy! It. History: The Lwchen came from Europe from about 1610. I have my Aunt's journals and I enjoy reading them so. She gave them to me while she was living but she is no longer alive. She is still with me through her everyday journal entries. A fantastic idea! I love that it has an interesting design! My daughters' like to write a lot now, so a journal would be perfect! I love this book because I really enjoy looking back at what MY mom wrote in her own little "journal" when I was little. I'd like for my kids to have the same thing and to be able to look back at a time they may not remember when they're older. Fantastic book for kids to journal! Because I love to write- enything; list, diary, letters- and I'd like my children to love writing too, and this must be so fun for them to write such a diary, and for me to read what they wrote. I like this book because my kids are changing so quickly... I d love to capture them at this time in their lives. I would like to win this book to have as a memento of when they were growing up. Also, it looks like a great communication journal! Thank you for sharing and the opportunity to win! I would love to give my daughter this. She loves to write and draw and this would be a great outlet for her. Such a great idea!! Would love to start this with my son. Sounds like an awesome read! Would LOVE to win!!!! I would love to read this! I don't have any kids but I think it would helpful in dealing with the many children I babysit and my own younger siblings. I love this! 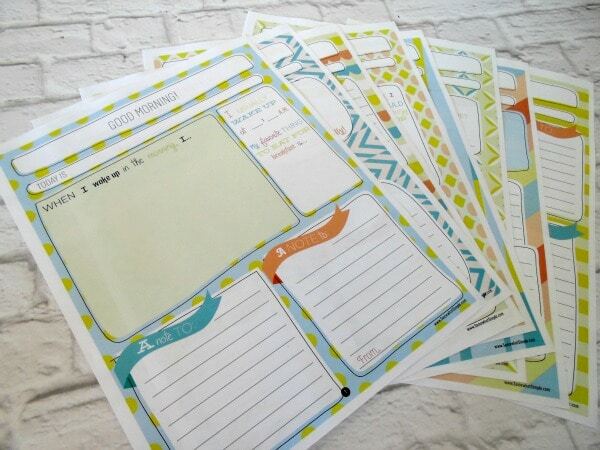 always wish I'd kept up a regular journal...what a great intro to journaling for kids! What a great way to get my boys to open up and learn to express themselves. Love the idea! Perfect to get to know my two boys better! This is such a great idea! I have been wanting to make a circle journal for my 7 year old who always says "nothing happened" when I ask about his day. This would help him work on his writing and it would give me a chance to see inside his daily life at school. I think it's something my boys and I would love doing together! My oldest son loves hearing stories about when my husband and I were young, so I think he'd especially enjoy creating a book of his own memories. What a perfect thing to enclose, on e completed, in my sons time capsule. Thanks for introing it. What a neat concept. Always looking for ways to stay close and in touch with my kiddos, and this encourages them to write, too. Wonderful. I have been trying to get my daughter interested in journaling for several months and I love the idea of a later bed time for journaling once a week. Would be awesome to win this...thanks for the chance! What a great idea!! I love that there's a section for parents to respond. 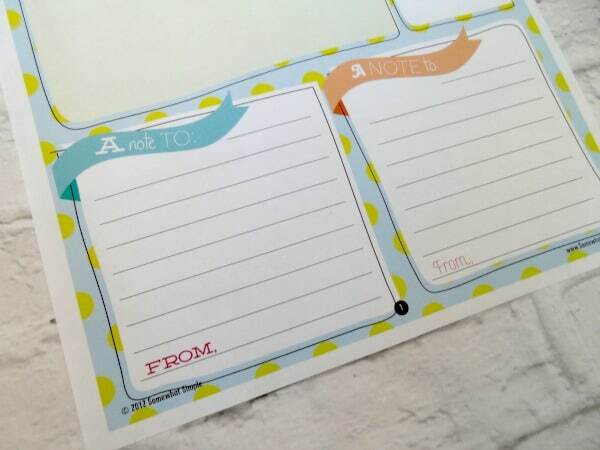 I would love this for my three, I always mean to write down the things they say and do and this would help. My 7 year old loves writing too, it would be lovely to create something together that we can keep forever. 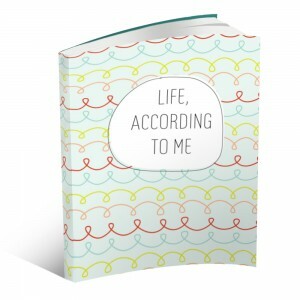 This book is an awesome idea, especially for young parents to write down the cute things their children do. I have so many things I can't recall from when my own children were very young that I am sad that I never took the time years ago to write things like these down. I would love to win a copy to give this to my son and his fiancee so they can use it for my 10 month old Granddaughter. She's doing such adorable things daily right now that they need to be written down. I would love to use this with my grandson. He lives with us and keeps us on our toes with his wit and creativity. This would be fun! 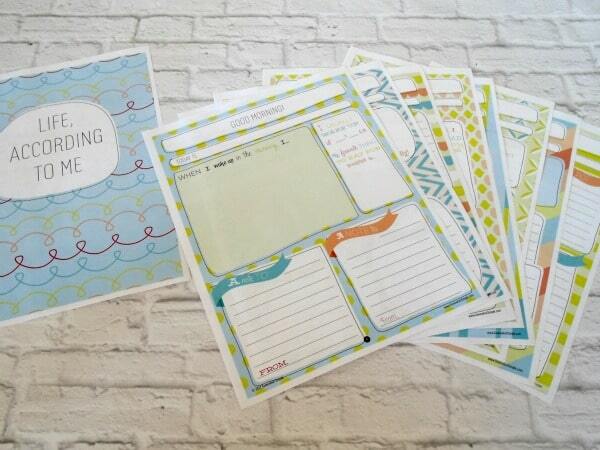 This would be a fun and attractive way to incorporate journal time into our home school day! Very cute. Would love to win this! Thank you so much! This is fantastic! I love to see how my kids' minds work! What a great idea. My girls would love this and I would love to see how they use it. I love the interactive nature of the book, and the writing prompts that help kids get started with topics. I would like this book to record the funny things my grandson comes up with. Id like to win this for my kids. I'd use it to make memories with my daughters. I love being able to go back and see how much my kids have grown up. I'm pinning this for the next birthday. what a great idea! I'd love to get this window into my kids thoughts as they grow. I love journaling and I would love for my daughter to grow up with this love too..especially in this day and age where its just too easy to get lost in the technology jungle...a pen and paper and a quiet time to yourself always provides that element of calm in your life that no social media or online journals can....thanks for the chance! I would love to win this! I have three children, two boys and then a girl and they are all lovely and frustrating in equal measure! I'd love to get inside their thoughts a little and may be we would get through the frustrating moments quicker and easier! This book looks awesome! Thanks for the opportunity to learn more about it! It is good for kids to learn to express themselves. I would be giving this to my grandson. Thank you for the opportunity! Love this! Will be great way to learn more about my kiddos. I would love to have his to share with my 2 girls! I think this would be great for my grandson! This is a great idea for children and parents. Thank you. I love journaling and encouraging my shorties to read and write. This is PERFECT! Great homeschooling addition to get my 5 year old thinking about writing and my 8 year old actually writing. Thanks. Great idea! Made for my granddaughter! I would love to do this with my boys! This book is a great idea! This seems like a great idea to use with my daughter who we are homeschooling for kindergarten. Thanks for sharing. I love the informaation you learn about your child. I love this book because my 2 kids are 5 yrs apart, and they think and act so differently from one another! This book would help communication with each one on their own level! I love this! What a great idea! My daughter would love filling it out. I love that it helps us all slow down a little to learn more about our kids and develop a deeper relationship. And it looks like so much fun! What a great idea! I have one that really needs handwriting practice as well so double whammy! I love scrapbooking and journaling. I would like my kids to get the same habits as well. Plus it is so darn cute! I'd love to get a closer look inside this. thanks for sharing it! This would be awesome for looking back to see how they change and how their likes and desire change over time. Love this idea with 3 sons aged 16, 15, and 8, I see how fast they are growing & I am always looking for ways to spend more quality time with them! I think this would be a huge help to my oldest since he doesn't like to talk but enjoys writing and drawing! I would love to win one of these. This is something they could use and then look at back at it when they're older. I think this will be a wonderful idea to do with my granddaughter too. She loves to do art but sometimes it would be nice to have on paper some of her ideas in words. I think this is a great idea. She is home schooled. My kids are very reluctant writers, hopefully the prompts will help get them started. Thanks for the giveaway!! it seems like a simple and creative way to record my son's thoughts-as much as i like to write little snippets down in one place, it doesn't always happen=this is perfect! thanks. This would be a fun way to have some good memories of my kids. Love the space for the child to write a letter to me and then a space for my response. Love this whole idea!! Thanks for the chance to win one! How could I purchase this for a gift....? Would it be possible to have it go to the gift reciepient's inbox... ?Thanks! Love this idea! - Create a priceless piece of family history, a special keepsake to share with their future children. I love this because many kids get writer's block when asked to do creative writing and these "prompts" would stimulate their creativity, as well as give insight to thoughts parents would otherwise never realize their kids were having. Great idea! It's scary how I'm forgetting little details about them. Things I swore to always remember. I actually know the woman who created this. Very, very cute idea! Love it! Sounds like a wonderful idea to bond even more with our kids! I would love to win a copy of this book! My kids are growing up so fast and I wish I could find time to journal about them but right now its so hard. This would motivate me to actually journal with them and would give them an opportunity to allow their voices to be heard in a way that we can enjoy for years to come. This is a great! Love it!!! I think it will be a great way to look back and remember how my kids were and what they thought when they were young. What a great and fun book to start out the new year! Excellent idea. My daughter is only 1 but I already sometimes feel like I there are special little moments I should record somewhere and I'm too lazy to design something like this on my own. This looks so cute. I would love something like this to encourage my son to express himself and practice his writing. This would make a great asset to homeschooling. It could get them on the path of journaling and the colorful pages make it fun. I love to read about my kids insights and thoughts.